Boxes, lines, groups, and tables are the basic types of items that comprise a layout in QuarkXPress. 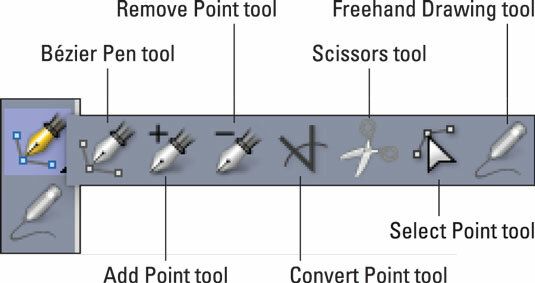 The tools for creating all these items are (not surprisingly) in the Tools palette, shown in the following figure. Boxes: Text boxes, picture boxes, and no-content boxes, which are useful for creating decorative items. Boxes can take any imaginable shape, from rectangular to wavy. Lines: Simple lines, arrows, and paths for text. Lines can be straight or Bézier (flexible). Groups: Sets of items that have been stuck together so that they behave like a single item. Tables: Can contain both text and pictures. Tools in the Tools palette. The Item tool lets you move, resize, rotate, reshape, cut, copy, and paste items. The Text Content tool lets you create rectangular text boxes, as well as select text in text boxes or on text paths. The Picture Content tool lets you create rectangular picture boxes, manipulate pictures in picture boxes, and cut, copy, and paste pictures in picture boxes.